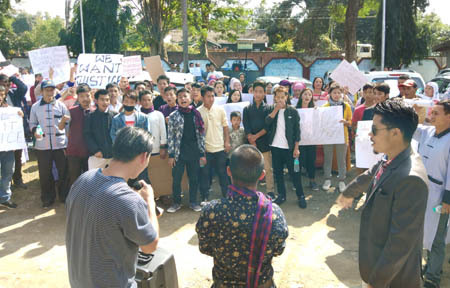 MIAO, Feb 11: Members of the All Changlang District Students’ Union, the All Tangsa Students’ Union, the Miao Singpho Ramma Hpung, the All Yobin Students’ Union (AYSU) and the All Tutsa Students’ Union on Monday took out a protest rally here against the citizenship amendment bill (CAB) and issuance of permanent resident certificates (PRC) to non-APSTs settled in a few districts of the state. The unions registered their concern on behalf of the wider public, strongly opposing the granting of PRCs to the non-APSTs residing in Changlang district, including the Ahoms, Deoris, Gorkhas, Sonowals, Adivasis, Kocharis and Misings. The protestors later submitted a four-point memorandum to ADC Tage Rumi. The memorandum also highlighted the apprehension that more non-APSTs may demand PRCs if it is not rolled back, and sought bringing all such people under the purview of the inner line permit system. The leaders of the unions questioned the legislators of the district for being “mute spectators” while the people of the district were opposing the two issues. They also questioned the integrity of the joint high power committee (JHPC), and said Changlang district has been opposed to granting of PRCs to non-APSTs since the beginning. Earlier during the rally, the participants shouted slogans against Chief Minister Pema Khandu, Deputy CM Chowna Mein and JHPC chairman Nabam Rebia. They carried banners and placards highlighting the stand of the unions. It claimed that the land had been allotted on lease and the allottees were liable to pay the land value and lease rent. “One such land allotment order was issued on 18 April, 1990,” the union claimed, and questioned the legality of the settlers demanding PRCs. The AYSU also presented another document to reporters – an affidavit filed in the office of the Vijaynagar executive magistrate in 2017, wherein a person from the Gorkha community claimed that he was born in Mazgaon village in 1948, while the settlement of the ex-AR men took place between 1968 and 1971. Besides several indigenous tribes of Changlang district, a large number of people from remote Vijaynagar also participated in the rally.